On February 1, 2019, Italy blocked the European Union’s statement recognizing Juan Guaidó as interim president of Venezuela, thereby compromising again the EU’s common foreign policy in front of the whole world. For the European Union it is becoming increasingly difficult to maintain unity and solidarity: today deep differences exist not only between the “old” and “new” members of the Union, but also within the “core” of the founding states. The clearest example of this is the conflict between Rome and Brussels and fundamentally different ideas about the future of the EU between the top three - Italy, France and Germany. Will the “integrationists” in Paris and Berlin manage to whip into line the Italian “sovereignists” or will have to reconsider the balance of national and supranational sovereignty within the EU and look for new basis for confidence building within the Union - this is the key issue for the future of the EU. 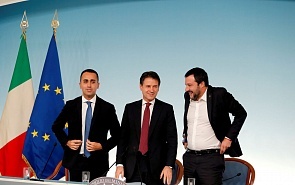 For ten months, while the new Italian “government of change” is in power, it has managed to sharpen seriously the discussion on a number of key issues of supranational integration. Practically, this affected primarily the rules for refugees distribution and borders security control of the Union, as well as the financial discipline of the member states. The conflict between Rome and Brussels around the Italian budget plan for 2019, the demand to revise the Dublin agreements and create a “fair” system of refugees distribution and equal responsibility of all coastal states to accept ships with refugees are among the most pressing issues on the confrontational agenda. However, the deep foundations of contradictions lie in the different views of the EU founding states on the degree of sovereignty of national governments, including finance, migration, or foreign policy. Without waiting for the concrete fruits of the agreement on migration reached at the EU summit in June, the Italians began to act separately. In particular, in autumn of 2018 the sensational “law on security” was adopted, where Italy sovereignly defined the rules for the maintenance of migrants who applied for refugee status and the rules for its provision. In addition, Italian Interior Minister Matteo Salvini declared the Italian ports closed to ships with refugees, which caused ire in Paris and Berlin. He also urged to focus on helping migrants on the Libyan coast, as long as the EU countries cannot agree on a fair distribution of refugees and the creation of an efficiently functioning EU border control system. The same words begin to sound from political leaders of other EU countries, in particular, Poland. There is a risk that such an approach will gain weight in other countries of the Union. Moreover, today the extension of Operation “Sofia” is in doubt. Italy demands its revision, and Rome plays a key role in the implementation of rescue measures for ships in distress. Coordinating the budget plan for 2019, Italy made concessions to Brussels, agreeing to reduce the budget deficit, however, the guaranteed income of a citizen was introduced, as well as the “100 quota”, which allows to reduce the retirement age to 62 years. According to Brussels, these measures will have a negative impact on the country's economy, while Rome insists on revising the measures of financial discipline, depending on the economic situation in each particular country. The further discussion within the EU on the economic sovereignty of states will depend largely on whether the “government of change” will succeed in stimulating the national economy by implementing its “economic maneuver” and providing social support to the population. It is worth noting, that the economic performance of Italy continues to deteriorate. On February 1, 2019, a negative GDP growth was recorded in the fourth quarter of 2018 (-0.2%) and a technical recession was announced (for the first time in the last 5 years). Growth in 2018 amounted only 1% of GDP. Thus, the Italian government will have to make great efforts to see the positive results of Italian “sovereignism” in Brussels and in other EU capitals. However, no matter how “enfant terrible” Italy is, it is not alone in desire to reconsider some aspects of European integration, such as financial instruments, migration management or the EU’s common foreign policy. The Italian-French-Polish coalition of Eurosceptic parties is in process of formation, causing strong discontent in official Paris and Berlin. How strong is the position of the European “sovereignists”, it will be clear in May, during the elections to the European Parliament. Nevertheless, it is already clear that to overcome the crisis within the EU is possible only if at least the “core” of the Union finds a new balance between national and supranational sovereignty and new internal factors appear that contribute to the formation of “confidence” among them.